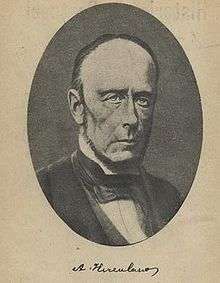 Alexandre Herculano de Carvalho e Araújo (March 28, 1810 – September 13, 1877) was a Portuguese novelist and historian. This article incorporates text from a publication now in the public domain: Chisholm, Hugh, ed. (1911). "Herculano de Carvalho e Araujo, Alexandre". Encyclopædia Britannica. 13 (11th ed.). Cambridge University Press. pp. 344–345. Wikimedia Commons has media related to Alexandre Herculano.